Looking at these pictures you would never guess that there was a thunderstorm going on and rain was pouring down. At least the rain was nice enough to hold off until I finished grilling the corn and get the grill under cover before unleashing its fury. But then the blackest clouds moved in and I was having to take pictures in near darkness (thank goodness for a tripod). Unfortunately, that seems to be standard operating procedures these days as we’ve had thunderstorms on an almost daily basis for the last few weeks. So let’s just pretend that it’s perfect June grilling weather. After all, someone out there must be having sunny weather somewhere. This recipe is an old favorite of ours but I hadn’t made it in years. My husband reminded me of it a couple of weeks ago when we got some gorgeous freshly picked corn from the farmer’s market. Even though sweet fresh corn hardly needs any extra adornments, we were in the mood for something beyond the standard steamed corn with butter and salt. Grilled corn with southwest butter fit the bill perfectly. There are many techniques for grilling corn and everyone has an opinion on which method is best. 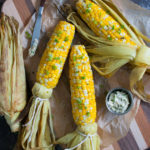 This recipe uses both the in-husk and foil wrapped method to grill the corn which I find keeps the kernels plump and juicy. The slathering of butter pre and post grilling may be decadent but ensures full flavor. You can be as generous or restrained with the butter as your heart (and swim suit season) dictates. Combine all the ingredients except corn in a small bowl and mix until evenly combined. Set aside. Peel back the husks from each ear of corn being careful to leave the husks attached. Remove and discard the silk. Spread about half the butter mixture over the corn kernels evenly dividing the butter among the ears of corn. Replace the husks and tightly wrap each ear of corn in a double thickness of heavy duty aluminum foil. Grill the corn for 30 minutes, giving each ear a quarter turn every 10 minutes. To serve, carefully remove and discard the foil. Pull back the husks and tie them with string for easier handling. Spread extra butter on corn as desired. The number of ears of corn this recipe makes depends on how generous you want to be with the butter.